South Orange County has an abundance of trails, unknown by many residents and visitors to this stunning California Coastal area. The remarkable areas vary from sandy beaches, inland canyons, and trails with panoramic views of the sometimes snow-capped Saddleback Mountains, all the way to the majestic Pacific Ocean. 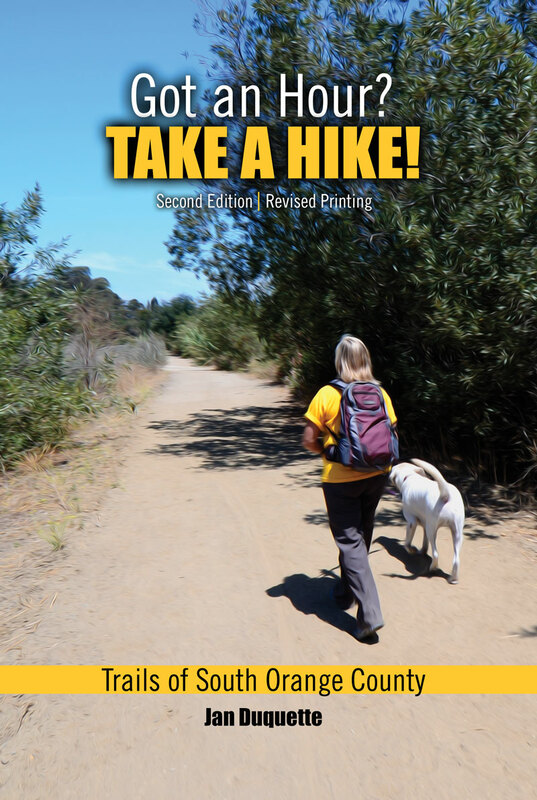 Unlike many hiking books written about Orange County, Got an Hour? Take a Hike! Trails of South Orange County covers an abundance of scenic trails in the hills. These trails offer hikers a wonderful experience, are less crowded with people, and are free. The cities of San Clemente and San Juan Capistrano have done an excellent job maintaining their trails with new trail signs, (providing aerial views and trail information), along with informative websites. Features hikes based on an average of a comfortable pace of 3 miles per hour. Rates trails from easy to challenging – Variety for everyone - including families. Includes the distance, rating, elevation gain, specific address of the trailhead, and parking information for each hike. Showcases a list of Orange County’s dog friendly parks, and beaches to share with your canine friends. Who Knows Where You’re Going? Jan Duquette has been a faculty member at Saddleback Community College since 1977. She received her Master’s Degree (1981) in Curriculum and Instruction from San Diego State University,and her Bachelor’s Degree (1974) in Physical Education from Arizona State University. Her professional service and certifications include; Chairperson of the Community College Section of CAHPERD (1980); Author of Aerobic Dance: A Guide for Students (1985); Who’s Who in the West (1986); Certified Fitness Master Instructor by the American Council on Exercise, and Certified as an Advanced Fitness Specialist by the Institute of Aerobics Research. She is a member of the International Association of Fitness Professionals (IDEA), CAHPERD, and NEA. New courses she has created while at Saddleback College include: Power Aerobics, Step Training, Muscle Toning for Women, and a required associate degree class—Survey and Assessment of Fitness (with coauthor Duane Cain). She was responsible for designing the first softball field at Saddleback College and establishing the women’s intercollegiate softball program. Duquette is currently Department Chairperson for Kinesiology. In addition to the above accomplishments, she has earned her Private Pilot Certification, trains quarter horses, and competes in Professional Rodeo Women’s Barrel Racing.